Egger have been producing laminate flooring for over 20 years and are one of the leading suppliers of laminate in Europe. Their high quality laminate floors are durable, versatile and affordable with multiple thicknesses and designs available from beautiful wood effect planks to chic stone effect tiles. Versatile- Egger laminate can be installed into both residential and commercial properties. Choice- Many options are available from wood, stone and concrete tile designs. Anti-Static- All Egger laminate flooring is manufactured with anti-static technology. 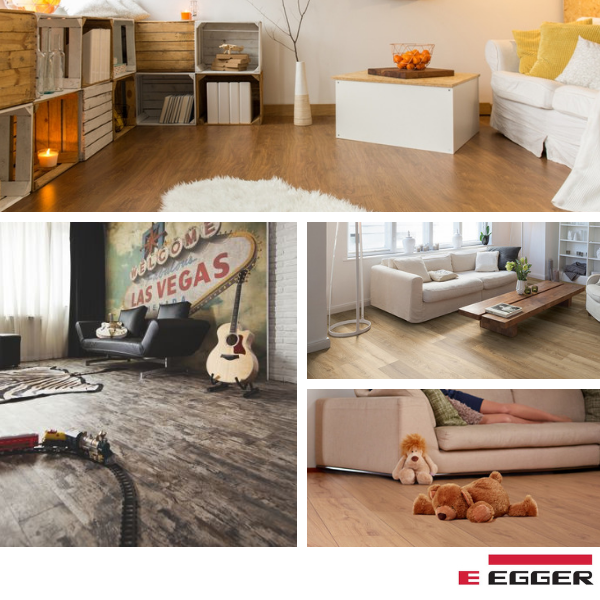 Resilient- Produced to the highest standards, Egger laminate is extremely hard-wearing. Wet Areas- Egger Aqua Plus laminate has water resistant joints making it perfect for Kitchen and Bathroom installations. Hygienic- A solid sealed surface means that Egger laminate repels dirt and easy to clean making it perfect for allergy sufferers. Download The Latest Egger Laminate Brochure Here.